Steve Forbert is grateful for having written “Romeo’s Tune,” which reached #11 on the Billboard Top 100 in 1979. Thirty-three years later, the singer-songwriter maintains a positive attitude, still thankful for the opportunities his highest charting song has given him. 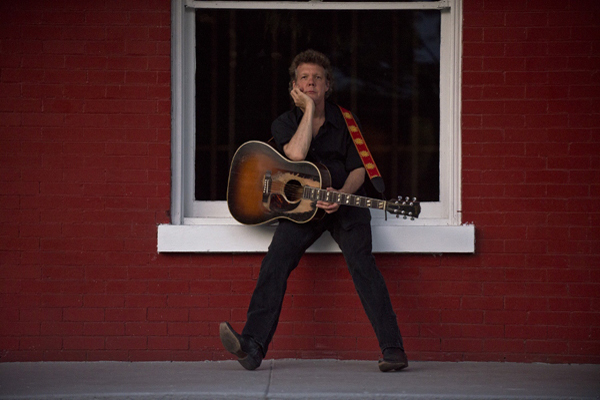 Like Warren Zevon, Gram Parsons, Bob Dylan, Tom Petty, and Bruce Springsteen, Steve Forbert has left his unmistakable imprint on the landscape of American music. What was the first piece of music you heard that made you want to write songs of your own? Probably “Mr. Tambourine Man,” written by Bob Dylan and recorded by The Byrds. Folk rock is the genre I like best and that was the first folk rock hit. What was the folk scene like in NYC in the late 70s? What is one of your most cherished memories of “that place and time”? When I arrived in NYC in June 1976, there were still a lot of clubs with hoot nights (open mic nights), and kids coming from all over the country to play original songs. One of my best memories was meeting songwriter Tim Hardin and playing a song or two for him one afternoon at the Other End Café. What was it like to be a folk singer playing CBGB’s in the late 70s? What is one of your favorite memories of CBGB? CBGB stands for Country Bluegrass and Blues, so you can see that it was originally opened with something else in mind. The owner [Hilly Kristal] was open to all music and liked a lot of American roots music. The punk thing just happened to find a home there. My favorite CBGB memory was when I opened for John Cale and his band. I really enjoyed the intensity of his shows. It was also fun opening for Talking Heads when they were just a trio. After “Romeo’s Tune” became a hit, did your approach to songwriting change at all? No, not at all. I still kept writing songs on any subject that appealed to me. I didn’t try to just strictly write upbeat love songs. How has your songwriting evolved since Alive On Arrival? It really hasn’t; I’m just trying to keep the quality of each song as high as I can – that remains the challenge. What Steve Forbert song has had the biggest influence on you? Either musically or personally? “Romeo’s Tune.” Having a hit single enabled me to tour the world, from the US to Europe to Japan. And it still makes for a pretty good calling card to this day. It would be a lot harder to still be working clubs and theaters if I hadn’t had a hit song. There are three years between The Place And The Time and Over With You. Why did you take the break? It takes that long to write an album now, which includes having extra material to pick from. We chose the songs we did because we wanted to create somewhat of a song cycle. What can we expect from Over With You? Over With You is sparser than my last few records and because of that, it comes off as a more natural and honest record. Also, the songs all deal with relationships – the good, the bad and the in-between. I liked taking a critical look at the word “forever.” It’s a word you hear every day, but what does it really mean? Richard Fulco is the founder and editor of the music blog Riffraf.